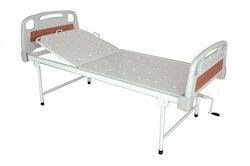 Our product range includes a wide range of flower bed manual, semi - flower bed manual and hospital bed side locker. 4 section perforated CRCA sheet and backrest. Removal ABShead and foot panel. Bed mounted on 125MM Castor. Positions : Backrest, knee rest. In the wake of the ever rising demand for reliable products, we are engaged in offering a wide assortment of Hospital Bedside Lockers. Frame work : Mild Steel Epoxy powder coated. Stainless Steel Top with four sides raise edges. One Storage Compartment and One Drawer.